But I’m going to try and not get too ahead of myself. After all, I remember The Master. More specifically, I remember the trailer, which promised a taut thriller based on Scientology. What PTA ended up giving us wasn’t bad, but I still feel like I missed something. My point is that trailers can be misleading so sometimes, it’s nice to view them as works of art separate from the film itself. 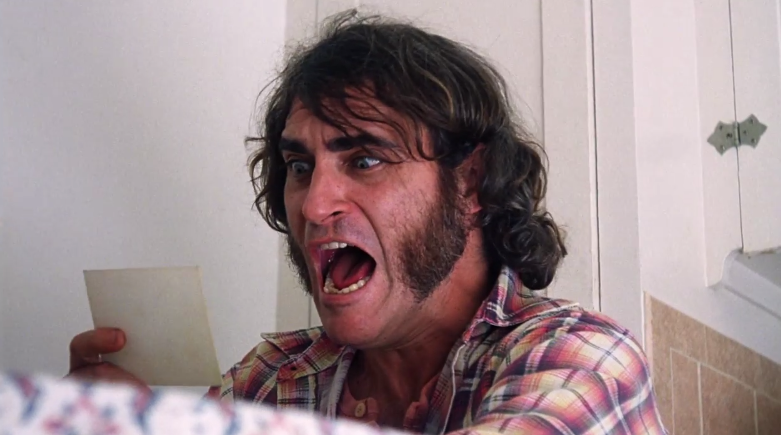 And holy crap, does the Inherent Vice trailer deliver. It boasts three odd music choices in under three minutes, acting that is already cracking me up, and the promise of a mystery I want to be a part of. I have no idea what Inherent Vice is about, but I have already seen enough to know that I am interested. Seriously, I think it’s time that the Oscars create a category for trailers. Let’s just hope that PTA Anderson still has some movie magic up his sleeve. Joaquin Phoenix is an underrated national treasure. Is it just me, or did anyone see shades of John Belushi in Phoenix here? Is it too late to cast him in the Belushi biopic? This entry was posted in Uncategorized and tagged 1970s, Inherent Vice, Joaquin Phoenix, Paul Thomas Anderson, Trailer, Trailers on September 29, 2014 by ian0592.